Each rectangular lap is of 6.25 kms. Do it twice for 12.5 kms, 4 times for 25 kms, 8 times for 50 kms and 16 times for 100 kms. All events are run counter clockwise and all finish within the athletics stadium. Those in the marathon (42.195 kms) will start at 1.555 kms from the start/finish line and complete that lap of 4.695 kms then a further 6 complete laps for 37.50 kms for a total of 42.195 kms. Measured and certified to AIMS/IAAF standard. There is one in the stadium and one half way around the course. The aid stations will carry water, snacks, Hammer Nutrition FIZZ sports drink. You also need electrolyte replacement, water alone is not enough. The aid stations will be taken down progressively from 7:30 pm. Cut-off times are not imposed, and no one has every been disqualified for failing to finish. 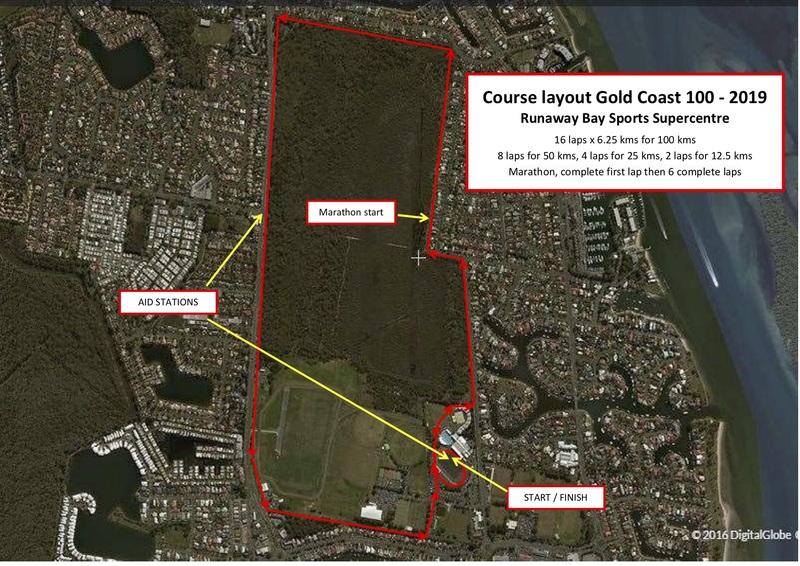 However, the course signage will be taken down from 4.00 pm (you should be able to find your way after running around in circles for 9 hours) and the outer aid station from 7:30 pm and the electronic timing will be removed after 14 hours, or at 8:30 pm. On race day, available from 5:00 am. 100 kms Solo – 6:30 a.m.
4 x 25 kms Relay – also 6:30 a.m.
50 kms – 7:00 a.m.
25 kms – 7:30 a.m.
12.5 kms – 8:00 a.m.
As soon as practicable after each event. Adequate parking is available at the western entrance to the Sports Super Centre, off Sports Drive, second entry from Morala Avenue, on the right. These will be required after sunset at or about 5:00 pm. There is a section of the course at the northern end which is unlit. To submit your interest to volunteer for this event please contact the race director directly. May be left in the stadium for access every lap of 6.25 kms. Make sure that your gear is clearly marked with your name. There are toilet blocks and showers at track-side. A qualified paramedic will be on hand. Notwithstanding the above, Angels or pacers will be permitted to accompany runners in the 100 kms event. There are limitations on the number of laps an Angel may run and they must be registered. Should it be possible, these will be available on the website in real time as the race progresses. Should this not be possible, then full results could be expected within 24 hours of the end of the race.